Taurus Hill Observatory | Taurus Hill Observatory in EPSC 2013, London 9.-13.9.2013. Posted August 30th, 2013 by Harri Haukka & filed under Misc. Taurus Hill Observatory will presents its research work in European Planetary Science Congress (EPSC) in London on Thursday 12 September 17:45–19:15 (EPSC Poster Area). The poster will be set up already on Wednesday, so it is possible to preview it before the poster session. 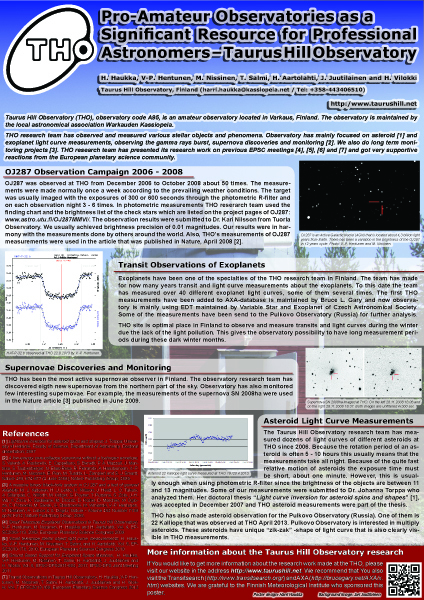 This time THO’s title of the poster is “Pro-Amateur Observatories as a Significant Resource for Professional Astronomers – Taurus Hill Observatory” and it will briefly present what kind of professional level of astronomy research THO has made. You are all welcome to talk with THO representative in front of the poster board P187. THO poster for EPSC 2013, London.